What should you do when your family does not support your dream? Keep dreaming, keep going, keep learning and keep growing. Welcome to Impact 60 Seconds of Motivational Mojo. I was just watching the Super Bowl and the whole world saw Eli Manning’s reaction to Big Brother Peyton Manning winning his Second Super Bowl in four tries. You have to wonder; why Eli who is surrounded by his happy family is so sad. Don’t let your family or your friends kill your dreams. Keep dreaming, keep going, keep learning and keep growing. Family Rivalries are nothing new. Some of the top Movie Stars and Musicians have gone through it; so learn from it, your dreams are your dreams. Your family may not supportive or may not be happy for you. You may have to be happy for yourself. Your friends may try to hold you back, you may have to find new friends; this is all part of learning and growing. I am not going to go on and on about the fact that you family and friends may not know who to support your dream, they may not be happy for you. They may be jealous of the fact that you have a dream that is different from theirs; or maybe they do not have a dream at all. Keep dreaming, keep going, keep learning and keep growing. That scene in Fred Claus nails the whole issue. The only problem is that was a movie. You may not be so lucky to have a Siblings Anonymous Support Group near you. Keep dreaming, keep going, keep learning and keep growing. Never let fear be your only option. “Danger is very real, but fear is a choice.” Will Smith in After Earth. Never let fear be your only option. I say this to you because I know fear, and I have to make a choice not to be afraid. I had to make a choice to explore options instead of being afraid. This is why I tell you, never let fear be your only option. Search your mind, find a quite place and learn to consider that you have options. Welcome to 60 Seconds of Motivational Mojo, where I try to spread a message of hope. Many times fear can be a motivator. This is not a good motivator, but it can be used as a motivator by those who crave power in all the wrong ways. I have heard it said “It is better to be fear than loved.” I am sorry, I do not think this way. So I will continue to blog and continue to sharpen my message until maybe I am being quoted one day. When fear is you only option, you will do things you do not like to do, or even want to do to get what you think you need. Never let fear be your only option. Let me explain in the simplest way that I can. Why do people work jobs they do not like and work around people they do not like? Out of fear of losing their job, people put up with this out of fear they may lose their main source of income and not be able to replace that income. Luckily I have been that person who believes you can always find another job. I do my best to work around people I like doing something that I believe I can do well. That does not mean that I have never feared losing my job, it means I do not like being in a situation where fear is my only option. I am not going to give you some fancy acronym for fear, it has been done before; I am going to challenge you to find a quite place and explore all your options. Now do not let me down play the fact that danger is real. There are certain places on this earth that are very dangerous. There are certain people on this earth who will put you in danger as a form of control over you. I am not saying I can stop this from happening, I am very much saying that I realize this is a fact. I also realize that you must, must, must not limit yourself by believing that fear is your only option. You must find enough peace of mind to explore all your options. Never let fear be your only option. Peace, Hope, Courage, Love, Wisdom are all strong places where you can find more choices. Fear will do it’s best to crowd these concepts out of your mind. Don’t let it. Keep your mind engaged, and never let fear be your only option. Now let me take you back to my example. If you are worth what you are being paid, than you can find another job that can pay you as much or more than you are making now; but it is up to you to find that job. The job will not find you; very rarely will a new job just fall out of the sky. You must put forth effort to find your next move; you must explore your options. Are you willing to help others? Are you willing to learn from and teach others? Are you willing to take on more responsibility? If you are than you have options, you only need to find them. Never let fear be your only option, always have faith. Find a quite place where you can train you mind to increase your knowledge and wisdom. Find a way to walk in love of others. Yes; I realize Danger can be very real, but fear is a choice. Leadership is like Dodge ball: You can throw it, catch it or dodge it! Welcome to 60 Seconds of Motivational Mojo, where I find Leadership in the strangest places. So you may be wondering how Dodge ball teaches leadership; that is my task for today. To convince you that Leadership is like Dodge ball: You can throw it, catch it or dodge it. So in Dodge ball, you have to be good at Throwing, Catching and Dodging, just like in Life and just like in Leadership you have to know when to throw, when to catch and when to dodge. Now most of the time, Leadership is not about dodging, it is about catching. So ok, here we go. Life will throw lots of things at you. Can you throw it back? Can you roll with the punches? Now before you can throw, you have to catch, you have to track down what life is throwing at you and throw it back. Now I am not talking about how much junk life throws at you. I am talking about adding value to the things life throws at you. Work, School, Hobbies all the balancing acts in life. Can you catch everything that life is throwing at you and can you give back your best? There is only so much you can catch. Now if you have to dodge, don’t dodge the important things. Your values and your family have to come first. Then you work, work is important to pay the bills. Leaders can not afford to dodge the important things. You have to catch the important things and throw them back at life. Keep rolling with the punches. Now the things that are not important, the things that do not add in value to your life or your work, dodge those. Know when to not try to catch everything. 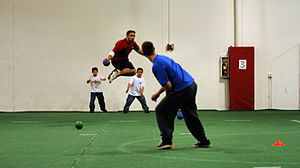 When I was growing up we played Dodge ball on Basket ball courts, we used a different set of rules: “A variation if the dodge ball game is played on a basketball court is that if a player throws the ball and it goes into the opposing basket, the whole team gets resurrected.” That was the game I got used to playing. I was the player who could throw ok, I could catch ok, I was really good a dodging, but I could hit that half-court shot. I was the guy how tried to get my whole team back in the game. That is the kind of leader I want to be. I want to be the Leader who helps get his whole team into the game. Now some people on your team are going to be great throwers, some will be great catchers, and some will be great dodgers and some will hit that half-court shot. Know how to get the most out of your team and out of your life. Know what is important to catch and what to dodge. Know how to get the most out of every throw. Learn how to keep your team fully engaged and in the game. Hit that half-court shot and improve your odds dramatically. Leadership is like Dodge ball: You can throw it, catch it or dodge it!